Alley cafe describes itself as combining the style of a bar with the relaxed feel of a European cafe. It’s quite a fitting description, and you also have the distinct feeling you are in a vegetarian paradise. It probably wouldn’t be quite described as a restaurant, less than 2 hands were needed to count the number of tables. The menu too is dominated by more casual food, breakfast items and sandwiches making up the majority of options. 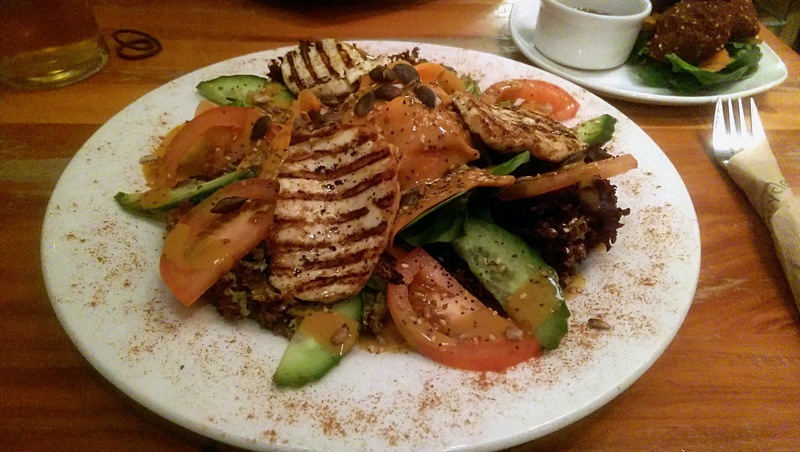 I picked out a halloumi salad with a side of oriental tofu orbs for something a bit jazzier. The salad (£6.75) was a pretty substantial number, three thick slices of cheese sat atop plentiful leaves and chunks of tomato & cucumber. The little things made all the difference, pumpkin seeds adding welcome texture, and a particularly good dressing bringing a fruity sharpness that lifted the dish. The orbs (£4.65) had a crispy outer shell that gave way to a texture that was a bit unpleasantly mushy but a nice balance of Asian herbs and spices. 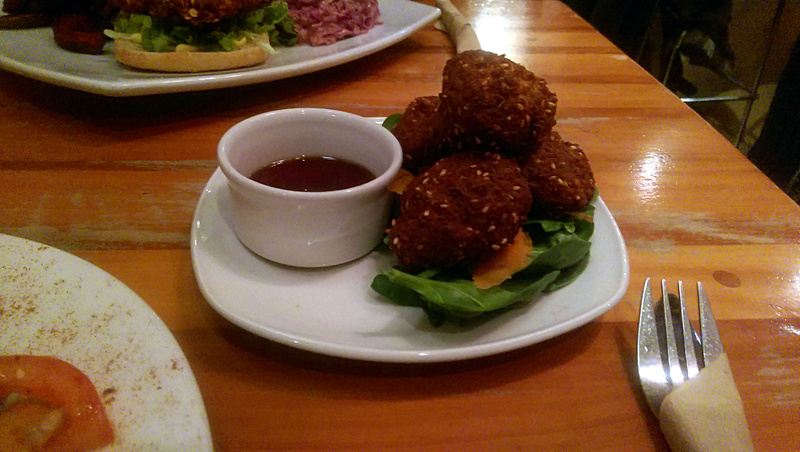 A tasty dipping sauce of sweet chilli added an extra dimension and a bit of heat that the tofu itself was lacking. Vegan ice cream was too good an option to turn down for a dessert; mint choc chip, raspberry and caramel scoops. The joy of ice cream in my experience is the rich luxurious texture that the cream brings. But no cream here of course, and what was left was a bit baffling. Where they could have made a sorbet or the raspberry they managed to devise something lacking any fruit flavour at all. The mint ice cream was more like a sorbet which again was a little odd and felt confused. The only passable one was the caramel and “the best of a bad bunch” comes to mind. I’m sure if you are a vegan and have never had ice cream there might be something of interest here. For anyone that knows the real deal with is a pretty meek imitation. They gave everyone a free brownie though, baked chocolate dessert points for that. In a chain where you might get the equivalent it would likely cost £1/2 more and you’d get something a little less rough around the edges. But it’s probably for its eccentricities that I’d choose alley cafe over one of those places, stick clear of diary replacements though. I’ve been relatively kind in tailoring most of my score to the savoury elements which were pretty nice for the most part. If you’re looking for more vegan and vegetarian destinations in Nottingham, Café Roya in Beeston is another good choice.